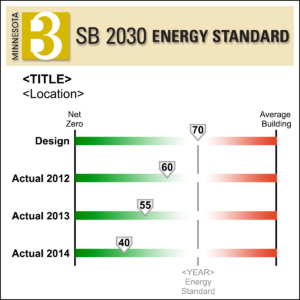 The B3 Sustainable Building 2030 (SB 2030) Energy Standard is a progressive energy conservation program designed to significantly reduce the energy and carbon in Minnesota commercial, institutional and industrial buildings. Based on the national Architecture 2030 program, program, SB 2030 has been tailored to the needs of Minnesota buildings. 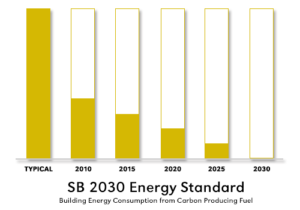 The SB 2030 Energy Standard for all projects built after 2010 is 60 percent below that of an average building. Then in 2015, the standard becomes 70 percent better and so on until net zero energy is reached in 2030. The SB 2030 Energy Standard is required on all projects that receive general obligation bond funding from the State of Minnesota. SB 2030 can also be used on a voluntary basis on any project. If the B3 Guidelines are used, the SB 2030 Energy Standard is automatically included in the process. Data collected as part of the B3 and SB 2030 programs will be publicly accessible, including on the B3 Case Study Database (more information below). Compliance with the SB 2030 Standard is achieved by a combination of on-site renewable energy generation and energy efficiency. For further information on which renewable energy systems can contribute to meeting an SB 2030 Standard please contact B3 Guidelines Support. All Minnesota State bonded projects—both new and substantially renovated—that have not begun their Schematic Design Phase prior to January 1, 2015 will be required to meet the Minnesota Sustainable Building 2030 (SB 2030) 2015-2019 Energy Standard. Projects that begin their Schematic Design phase on or after January 1, 2020 will be subject to the 2020-2024 Standard: achieving an 80% reduction from the Average Building Baseline. Note that several documents below have different versions depending on which Standard is being used. Projects meeting the B3 and SB 2030 programs are evaluated for compliance during design and construction and for a period of 10 years of occupancy. As soon as you have identified that you have a project that is required to use the SB 2030 Energy Standard, contact B3-MSBG Support to get your project set up in the B3-MSBG Tracking Tool. Contact Patrick Smith 612-626-9709 or sb2030@b3mn.org for assistance. You can use a Demonstration Version of the SB 2030 Energy Standard Tool, note that inputs to this demonstration version are not saved or transferable to a project file.